Kem Weber (American b. Germany, 1889–1963), "Airline" Armchair, 1934. Milwaukee Art Museum, Purchase, by exchange M2001.128. Photo by Pat Jazwiecki. 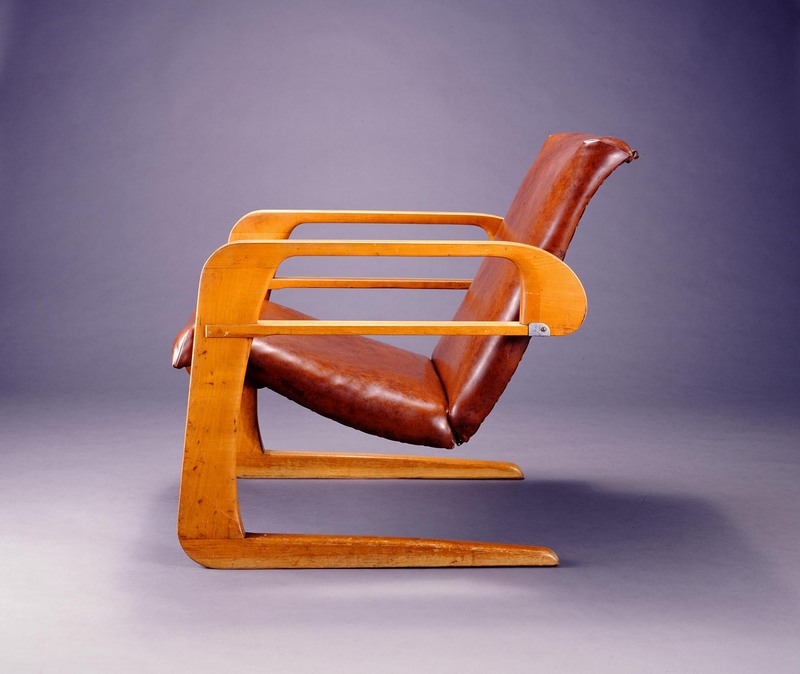 This chair is one of my favorite designs of the 20th century. Period. So sleek, yet soft! So comfortable, yet efficient! And now here I am, lucky enough to work every day in a building with “Airline” chair, the perfect type of museum object that looks stunning and can tell stories about its time and place. The Milwaukee Art Museum purchased the chair in 2001, and it is currently on view in the 20th-century Design Gallery (Gallery #30) on the Museum’s main level. The chair form is an icon of streamlined American Modern design. It is titled the “Airline” chair, but you don’t need to know its name to catch the visual reference to fast-moving locomotives and airplanes. Kem Weber was a 1930s-era designer living and working in California, and he is often credited with bringing Modern style product design to the West Coast. He was born Karl Emmanuel Martin in Berlin, and studied with the architect Bruno Paul (German, 1874–1968) before coming to the United States to oversee construction of Germany’s pavilion at the San Francisco Panama Pacific International Exposition. With the outbreak of WWI in 1914, Germany canceled plans to attend the upcoming fair, and Weber was trapped in California. So Weber built a career on the West Coast, even changing his name to be less Germanic–Kem, based on his initials (K.E.M.). He worked as an art director for the Barker Brothers store, and later formed his own industrial design studio in Hollywood. He is credited with adding a modern flourish to products. A great example is the Weber-designed “Zephyr” electric clock of 1934, with its case molded into a “sweep” shape that suggest the forward flowing motion of time. “Airline” Chair is his most well-known design today. It was an early form of furniture that was to be sold to the consumer in parts for final assembly at home (like IKEA). Unfortunately for living rooms everywhere, the design did not catch on and only about 200 were ever produced. California’s Walt Disney Studios office complex purchased many of the limited 1934 production. An article in Collectors Weekly about an upcoming LACMA exhibition includes an image of a woman both assembling “Airline” chair and toting it in a cardboard box. This year, curators Wendy Kaplan and Bobbye Tigerman at the Los Angeles County Museum of Art (LACMA) will present California Design, 1930–1965: “Living in a Modern Way”. Their major exhibition is the first major study of California mid-century modern design, and along with other designers, will bring new attention to California designer Kem Weber. LACMA’s exhibition (Oct 1, 2011 – March 25, 2012) includes the re-creation of a modern-style room that Weber designed for the 1939 Golden Gate International Exposition on San Francisco’s Treasure Island. Fly, don’t walk, to Los Angeles this fall and winter to see this important design exhibition. And, in the meantime, stop by the Milwaukee Art Museum to visit this spectacular chair. This entry was posted in Art, Curatorial and tagged 20th century art, California Design, Collection, Decorative Arts, Design, From the Collection, Furniture, Kem Weber, Modernism, streamlined design. Bookmark the permalink.